Adalay, Lawrence of Berkley, and joseph645, and DNO_Dennis headed up to Durand, Michigan Sunday afternoon to witness the arrival of the Southern Pacific 4449. 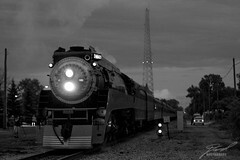 By the time the train finally turned and headed for Owosso the sun had set so I cranked up the ISO and got what I could. I thought this looked best in black and white.